Beauty definitely plays a role in my bad days. It goes one of two ways — either I can’t be bothered with make-up at all, or I want a full-on face of it. There is no in-between. Fortunately I have options for both those scenarios, so I thought I’d share them with you today. There are some days when I like to use make-up to cheer me up. 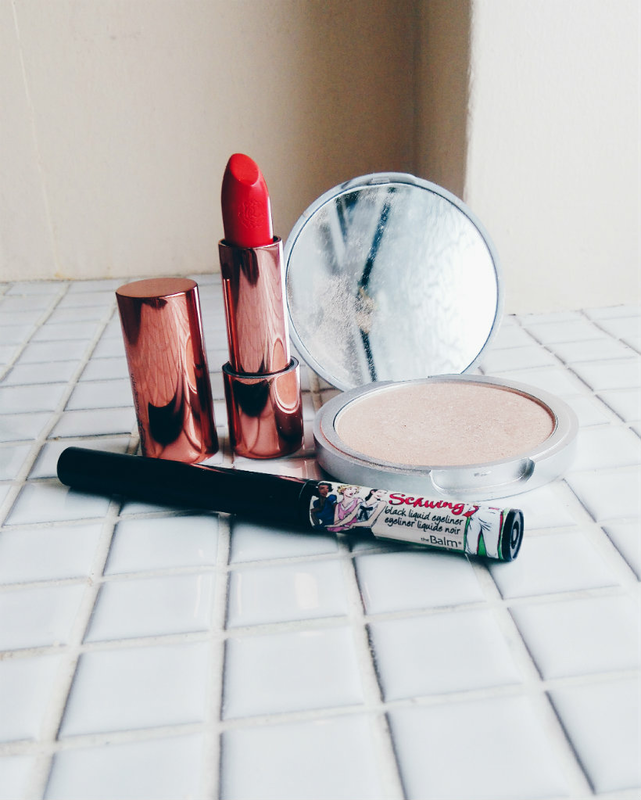 Truthfully this happens most days because I genuinely enjoy getting ready in the morning, but when times are tough and I need a little something extra, I have three fail-safe products. Winged liner is my favourite eye make-up look, no question, so I grab some Scotch tape and use my favourite liquid eyeliner, theBalm Schwing, to sketch out a sharp flick. This liner is perfectly pigmented — black, not dark grey — and lasts all day with no running, so there’s no need to worry about panda eyes. Another theBalm favourite now, and it’s the highlighter we all know and love — Mary-Lou Manizer. This champagne-gold shimmer gives skin a gorgeous glow, be it along your cheekbones, in the corner of your eyes, or the cupid’s bow. No bad-day make-up look would be complete without a killer lippie and recently I’ve been obsessed with Rosie For Autograph Lipstick in Super Model Kiss. A true orange-red, it looks equally stunning with the aforementioned winged liner as it does with a more pared-back look. In fact, a slick of this lipstick is the perfect way to give the impression you’ve made an effort. My favourite shower gel at the moment was a Christmas gift — Rose Jam (v) from Lush. Sadly it’s part of the seasonal collection, so I stocked up on more bottles while I could! Its gentle rose, lemon, and geranium scent is the perfect pick-me-up, day or night. I’m not particularly good at remembering to use a body lotion, but when I do it’s often one from Soap & Glory. They make loads but The Righteous Butter Lotion (v) is the best, in my opinion. It has all the moisturising power of the original Righteous Butter but with a much lighter consistency, and it sinks in quickly, too. 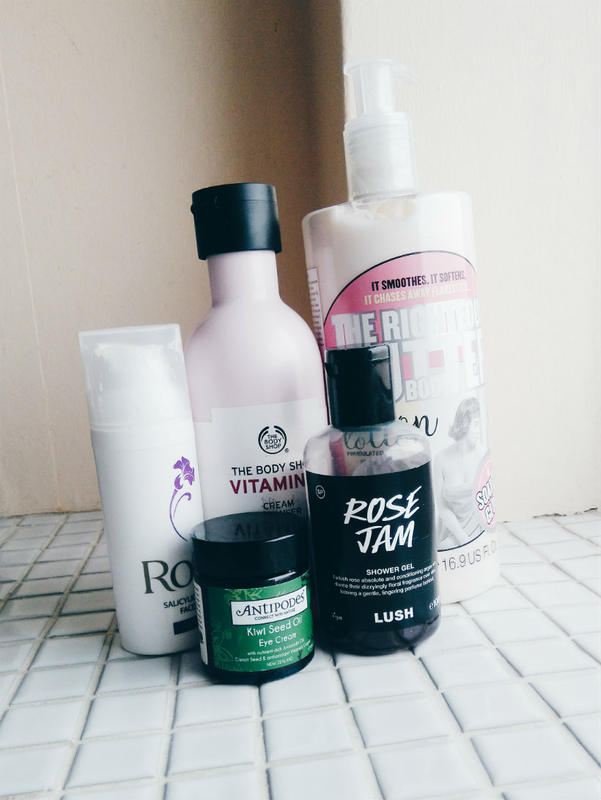 No bad day ritual would be complete some skincare! I often use The Body Shop Vitamin E Cream Cleanser when my skin needs something nourishing but light. I follow that with Antipodes Kiwi Seed Oil Eye Cream, which makes a noticeable difference at brightening up the eye area. Finally, I finish with Rossi’s Salicylic & Tea Tree Face Moisturiser, which is designed especially for combination skin and has worked wonders at calming down my acne. What rituals do you have on a bad day? Let me know in the comments!